If you missed it, make sure you check out my previous post on the logistics of setting up, organizing, and running a drumming circle in your classroom. 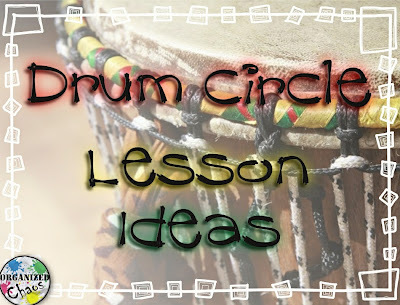 Today's post is focused on my favorite lesson ideas and activities to use in the drumming circle. These basic ideas have worked well for me with students in first grade all the way up to eighth grade (and I'm pretty sure they would work with high schoolers too!). I'm listing them here in the order that I usually introduce them to my students. 2. "Let's All Play Our Drum"
I start this by having them echo some 4-beat rhythms after me again, then having each person take turns playing that pattern all the way around the circle. Focus on keeping the beat steady and having no gaps between each person. Then explain that you are going to start passing a new pattern around the circle while the first is still circling. Have each student point to the person before them, to whom they should listen. The people across the circle will be doing a different pattern so they should NOT listen to them! My older students have been able to get up to 4 patterns going at a time. Everybody loves the challenge of this one! While we're in the echoing mood, I teach the students a more complex pattern, mixing some playing techniques and using more complex rhythms, with a mnemonic device- I match the rhythm to a phrase and have the students repeat the phrase after me several times so they internalize the rhythm. Our favorites have been, "yum, yum, tastes like chicken", "Mom, I'm home, and now I want to eat", and "come and get your ice cream! come and get it now!" (yes, I like to talk about food). Once they can say it correctly, I have them echo the pattern on the drum slowly while saying it, eventually speeding it up and taking away the words. This time, instead of copying the pattern of the person before them, everyone is going to make up their own rhythm! Each person gets 4 beats to improvise. Go around the circle without stopping (like the beginning of the Pass the Pattern game). For younger students I usually count each person's 4 beats by holding up my fingers towards them. I tell them that if someone misses their turn, that is a 4-beat rest- we will not give you another turn or stop for you! This is also a good time to talk about the importance of respect for yourself and others and especially focus on facial expressions. I encourage them not to make a cringing face when they improv (a common defense mechanism), laugh, or react negatively to anyone else's playing. Once students are comfortable improvising, remind them of one of the longer patterns you practiced with a phrase. Practice everyone playing that pattern together, clapping for 4 beats, then repeating the pattern. Once they can do that, tell students that the 4 beats of clapping is when one person will be improvising. Everyone will play the pattern in between each person's turn to improv. Everyone continues to improvise in this activity, but this time instead of going straight around the circle, you improvise in between each student's turn. Go all the way around the circle with this pattern once to make sure students understand the new order. Now tell them that if you play 3 notes (ti-ti ta or 1-&-2) at any time, everyone needs to copy it whether it is their turn or not. After that, the order will resume as before. Eventually of course I like to up the ante and have any students who miss the echo pattern put their drums down for the rest of the round. I also raise the level of difficulty with my older students by telling students they can also play the echo pattern on their turn (and they would improvise something else after everyone else echos). You can find all of the sources linked here, plus many other great drum circle and world music ideas, on my Pinterest board called Music Teaching: World Music and Drum Circles. If you have other great resources for drumming circles, please share and I'll add them to the board!! Leave a comment here or share on my Facebook page! Oh my goodness, that game is so much fun! And yes, it does help a lot for kids who are hesitant to make something up on the spot. Thanks for the comment! This is excellent! I have been looking everywhere for great resources to use with my 6th grade general music class and I think I have found it! Thank you so much for posting this! I use all of these. Love orbit game and Kalani's videos and instructional techniques are beautiful! After we have played games and improvised i play a piece of "New Age"ish music and we improvise along with that, eventually small groups forming patterns together and getting in a groove. Fun stuff!! Great tip! Playing along with a recording is a great way to help kids stay on track and come up with their own improvised grooves. I love all of Kalani's stuff too! Exactly what i was lookin for! Thank and greeting from Italy! Awesome, I'm so glad to hear you found some helpful ideas! I hope your drumming circle goes well! Enjoy! What a fantastic blog post! Have been looking for some ideas for mixing up our 6-8year olds' music lessons at school...these ideas will keep us busy for weeks and months to come! Thank you for sharing. I love the ideas! Drum circles are one of my kids favorite things to do. We just finished up one last week. We used body conducting-- one person goes into the middle of the circle and you may one noise for each step that they take. Love these ideas and will be incorporating them soon! Thank you! I love your idea. What a great way to keep students focused, and an awesome introduction to "conducting" :) Thanks for sharing! As I begin my first drumming unit, I found this post incredibly helpful! Thank you for providing a clear direction and guidance! So glad you found it helpful. Have so much fun! Drum circles are one of my favorite things to do in music class!! !